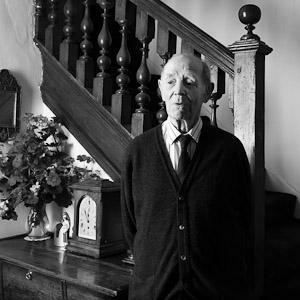 James Edward Ramsden was born in Liverpool on 1 November 1923. He married Juliet Barbara Anna Ponsonby in 1949. He was educated at Eton and Trinity College, Oxford. Ramsden served in the army during the Second World War. He unsuccessfully contested two elections at Dewsbury in 1950 and 1951, before winning a seat in Harrogate in 1954. During his years in Parliament he served in the War Department and became Secretary of State for War (1963-64) and Minister of State for the Army (1964). He retired from Parliament in 1974. "[Campaigning in Dewsbury in 1950 and 1951] was good clean fun. … There used to be children going around singing ‘Vote, vote, vote for Mr Paling / When he comes knocking at your door, / If it’s Ramsden and his wife / You can stick them with a knife, / And they won’t come knocking anymore!’ They used to sing that. One man I knocked up, I asked ‘will you vote Conservative?’ And he said ‘My dad said always vote for them as pays the wages’. My second election at Dewsbury … I’d been making a speech … and I suddenly noticed at the back of the hall the people looked like not quite ordinary people and I recognised Lindsay Anderson, the great film producer who’d actually been a fellow subaltern of mine in the Greenjackets, we’d shared a tent together. And we had a word afterwards and he flew at me like a tiger and he said how could you get up on that platform and tell all those lies, talk all that nonsense. …They’d been making some film in Ossett. That was a rather daunting experience. I never saw him again." Track 1 [00:52] [Session: 15 August 2012] James Ramsden [JR], born in 1923. Introduction; brief comment about JR’s earliest memory. Track 2 [05:14] Discussion about JR’s early memories with father working as a Master of Foxhounds in Warwickshire; comment about mother writing report about the days sport for ‘The Times’. [01:37] Description of JR’s family background; mother’s family banking background in Yorkshire; mother’s father and eldest brother both killed in Boer War; mother’s brother Sir Murrough Wilson MP for Richmond; on father’s side JR’s uncle, George Ramsden was MP for Elland where JR’s ancestors had established a successful brewery in Halifax [?Thomas Ramsden and Son]. [03:46] Description of opportunities open to his father as youngest son; father joining Fifth Lancers; brief description of father’s involvement in the Mutiny at the Curragh [see also Track 6, 07:20]. Track 3 [03:14] Description of how JR’s parents met; description of parents meeting at Crathorne Hall, home of the Dugdale family; comment regarding significance of this for JR’s future political career; comment on Thomas Dugdale being MP for Richmond and family discussions that JR might succeed him. [01:19] Description of Nancy Dugdale (née Tennant) and her political influence on JR; describes invitations from Nancy to stay at Crathorne to meet politicians such as R.A. Butler. Track 4 [06:04] Brief comment about Nancy Dugdale. [00:18] Description about the importance of religion to the family; anecdote about family prayers; comment about grandfather being a lay figure in the Church and that the family was quite evangelical. [02:04] Description of childhood home Manchester Manor, Warwickshire; anecdote about food supplies in the house; description of household staff; description of household cars; anecdote about gas and installation of electric. [04:44] Description about early education; anecdote about governess, like many women of her generation, losing fiancée in the First World War. Track 5 [24:44] Continued description of governess and early education; description of being sent to Westgate-on-Sea for school aged eight; early success at school leading to adults entertaining thoughts about JR following a political career; anecdote about parents unsure what JR would do for a career; anecdote about working in brewery during University vacations and JR deciding to enter politics. [04:09] Description about basis for family wealth based in brewing and land. [04:54] Description about schooling at Eton; anecdote about filling sandbags in preparation for war c.1938. [06:48] Comment about contemporaries at Eton who went on to political careers such as Edward Boyle and Sir John Lindsay Eric Smith; description of Sir John Smith. [10:28] Continued description about Eton especially during the war; anecdote about bombs falling on Eton School; anecdote about joining the Home Guard aged seventeen with expectation of joining army. [12:40] Description of joining the army after school; anecdote about difficulty of deciding which regiment to join given obsolescence of the cavalry; comment about officer cadet training at Winchester; anecdote about father’s advice on battle; description of military training; description of social backgrounds of men at officer training; description of U.S. servicemen at training including Stewart Alsop; description of posting to ninth armoured division. [17:18] Description of going to war; anecdote about frustration at not being part of D-Day and volunteering to fight in Yugoslavia; anecdote about training with Major General Percy Hobart’s ‘Funnies’; description about places where JR fought; anecdote about patrol and encountering an enemy tank; comment about excitement and lack of sleep; also comments about how war focussed everyone’s efforts. Track 6 [10:09] Description as to how JR became interested in politics; JR still at Oxford University and pushed by Thomas Dugdale; JR encouraged to get experience of fighting an election at Dewsbury; comment on work with Young Conservatives in Halifax; comment about father being prospective Conservative candidate for Sedgefield. [03:29] Suggestion family not strongly political. [04:01] Description of connection with Dugdale family; awareness of family history in politics and possibility of taking Dugdale’s seat at Richmond; description of vacancy at Harrogate and luck at getting it; comment about need for a respectable war; comment about Maurice MacMillan also seeking selection for Harrogate seat. [05:53] Description of Father’s involvement in Unemployment Assistance Board in the 1930s; family awareness of political background to the family; description of father’s involvement in the Mutiny at the Curragh; JR suggests in own career he never had particular political goals. Track 7 [05:11] Description of newspapers in childhood home; comment that Conservative orientation of family due to friends more than press; description of attending Oxford University and lack of pursuing politics at University; comment about dropping Greats before reading PPE; economics tutor Charles Antony Crosland; anecdote about studying with Tony Benn; comment about friendship with Thomas Macpherson, MC, at Oxford who had ‘had a good war’; comment about Marmaduke Hussey. Track 8 [36:26] Comment that by final year at Oxford JR had already decided on Parliamentary career and time at Oxford did not influence this decision. [00:41] Description of working life at family brewery whilst seeking election at Dewsbury; description of sisters and their work; description about income whilst seeking election. [04:00] JR not involved in voluntary or non-party political activities before the election. [04:38] Description how JR was selected for seat at Dewsbury; description of Colonel Orton [?] Conservative area manager and his having ‘had a good war’; description of selection process for Dewsbury; discussion about the importance of ‘having a good war’ for gentleman’s reputation. [07:48] Description of process for organising the election at Dewsbury and canvassing; comment about reaction on the doorstep and about a political song sung by children; anecdote about confrontation with Lindsay Anderson at public meeting; anecdote about canvassing the Community of the Resurrection. [11:34] Comment about luck standing for two elections at Dewsbury between 1950 and 1951; description of selection process for Harrogate in 1954; comment about others standing for selection being Maurice Macmillan and Tony Leavey; comment that agent for Harrogate, Mr Preston, was same agent JR’s uncle, George Ramsden, had at Elland; anecdote that Mr Preston thought JR’s wife Mrs Juliet Ramsden (née Ponsonby) should not be disturb during selection. [13:26] Anecdote about help received from friend’s father who was president of Harrogate Conservatives; description of differences in the selection process between 1950s and present. [15:53] Description of Christopher York, JR’s predecessor at Harrogate. [17:31] Comment that JR had very little contact with national party leadership or bureaucracy during elections; description of help from type of ‘candidates friend’ sent from central office to help; description of strength of constituency party; comment about strong involvement of women; comment about problems raising money; description of help given by constituency party during the election; description of Liberal Party poster campaign; description of nightly meetings during election; comment about agent’s work; anecdote about meeting at an old people’s home with agent. [22:41] Description about how election campaign was financed; comment about JR’s contribution. [23:36] Description of key political issues in the constituency, one issue especially was abolition of capital punishment, otherwise few constituency problems. [25:25] Description of key political issues raised during election, comment about private enquiries from religious communities; comment about ability to respond honestly to these groups given safety of Harrogate as a Conservative seat. [25:36] Description about public speaking and JR’s dislike for public speaking yet recognising its importance. [26:27] Description about national party involvement in election; comment about booklet on party policy and letter of support from party leader/Prime Minster; occasionally given visiting speakers such as Ernest Brown and Osbert Peake. [28:13] Suggestion that national political issues most important rather than local issues given the nature of the seat. [29:16] Suggestion no hidden costs during the election. [29:44] Description about entering Parliament for the first time; anecdote about being awestruck seeing Winston Churchill speaking in the House, Churchill attributed to Attlee and the Labour Party equal responsibility for the development of the H-Bomb; comment about widespread respect for Churchill [31:53] Suggestion that when JR first became an MP he was less struck by particular personalities, rather preferred to learn about the job; description of first entering Parliament, entering with chief whip and Thomas Dugdale; description about maiden speech; anecdote about advice on maiden speech given by the Speaker; comment about preference for speaking in the House than at public meetings; description of format for notes. Track 9 [44:33] Comment about surprising lack of facilities at Parliament; description of secretary Marjorie Mellor [? ]; anecdote about Marjorie Mellor and her room in House of Lords; anecdote about memorial for Marjorie Mellor in chapel. [02:02] Description about not having an office and of benefits of this; description of working in the lobbies; description about not being in constant contact via telephone and being beyond the instant reach of the media and constituents; description about gradual proliferation of telephones and offices in Parliament. [05:02] Description of Marjorie Mellor contacting JR and her experience being useful to inexperienced JR; anecdote about Marjorie Mellor visiting constituency. [06:54] Description of atmosphere of House of Parliament; description of close communal nature; comment that lack of offices added to this communal atmosphere; comment that members from all parties mixed; anecdote about barbers in the House and having hair cut with Aneurin Bevin and John Morrison and teasing one another. [10:26] Description of social life in the House, such as dining groups; description of the Suez Group; description of the importance of these groups for discussing ideas; comment about relative young age whilst in the House; anecdote about nerves sitting next to Harold Macmillan at dining club; anecdote about dining club discussions about who should succeed Anthony Eden as Prime Minister, JR suggested R.A. Butler; comment that JR’s earlier meeting with R.A. Butler at the Dugdales did not influence this choice nor did it influence his future position as R.A. Butlers parliamentary private secretary. [16:50] Description about sitting in the chamber for the first time and belief it was not so significant; comment that JR did not sit in the chamber enough; comment that sitting in the chamber an important activity. [18:41] Description about time spent at Westminster; comment about ability to get long weekends and number of weeks off; description of the sleeper train from London. [20:45] Description of maiden speech and its reception; description of second speech. [22:30] Comment about staff and facilities in House of Parliament. [23:12] Description about approach to working as an MP; comment that lack of preparation did not matter; comment about limited advice given; encouraged by friends to speak more; comment about limited aspirations to become a minister; description about working for ‘Daily Telegraph’ writing about Parliament. [28:05] Comment about surprise to be asked to work as a minister; description of working as parliamentary private secretary for Minister of State and later R.A. Butler; comment about working as secretary of 22 Committee. [31:09] Description of work with R.A. Butler; description of R.A. Butler. [32:43] Comment about limited number of issues JR pursued as a back bencher; comment about not experiencing any limitations or frustrations as a back bencher. [33:25] Description of JR’s relationship with the media; comment about trying to avoid journalists; comment about dislike for leaks from War Office; comment about journalists and bars in the House. [36:47] Description about home life; JR inherited home from uncle; comment about expenses and pay; description of accommodation in London; description about Parliamentary expenses; comment about extra-Parliamentary work whilst an MP; comment about restrictions on work as a minister; suggestion that work as a minister helped with future positions on Boards; description about father selling brewery. [42:25] Comment about office arrangements as a backbencher, parliamentary private secretary; description of private office in Home Office; description of secretaries listening in on phone calls to brief civil service. Track 10 [40:22] Description of libraries in Parliament. [00:46] Description of effect of Parliament on family life; JR’s wife understanding nature of work having been secretary to her father Sir Charles Ponsonby, 1st Bart; description of meeting wife; comment that wife’s family contacts helped JR with career in Parliament; comment that wife’s family had two other son-in-laws who became MPs, one of which was Michael Hamilton; description of children and family life in by-election 1954; anecdote about monthly nurse Sister Roe [?] and connections with Queen. [06:20] Comment about father’s reaction to JR’s chosen career; comment about friends expectations from Oxford. [07:03] Comment about membership of London clubs; comment about JR’s social life whilst MP; anecdote about Suez Crisis. [10:01] Comment about relationship with constituency party and constituency; comment about local press; description about Peter Walker’s reorganisation of local government and JR’s opposition to this. [12:32] Comment about constituency surgeries and description of those who attended; anecdote about surgeries with mentally ill woman; description of issues particularly relating to housing; comment about dislike for word surgery. [15:01] Comment about needing to attend constituency events. [15:51] Comment about not needing secretarial staff in constituency; comment about organising work; not pressured by outside pressure groups. [17:11] Comment about work in 1922 Committee and comment about One Nation Group; comment about dining club called Burke [?] Club, comment about membership including T.S. Eliot and newspaper editors; anecdote about William Rees-Mogg and withdrawing from dining club. [17:26] Description of relationship with whips; anecdote about Captain Henry Kirby and Edward Heath as deputy chief whip; comment about good relationship with whips as Parliamentary Private Secretary to R.A. Butler. [21:41] Comment about political alliances developed in the House, men such as Richard Sharples, Marcus Kimball, Jasper More, Bill Deedes; comment about Private Members Bill and help from Bill Deedes; comment about One Nation and meeting associates in the House; comment about limited number of Select Committees and importance of informal party committees for keeping groups of politicians together and busy. [24:41] Comment about engagement with cross party groups; comment about having a regular pair in George Sylvester and Dr Alfred Broughton; comment about friendship with Reginald Paget and Douglas Houghton; comment about helping Reginald Paget. [26:47] Comment about work on committees; comment about committees being useful for opposition but boring for governing party; comment about boredom of Scottish Grand Committee. [28:05] Comment about inter-parliamentary committee and visit to India, Pakistan and Salon; anecdote about visit being just after Indian independence and fuss made of Gordon Walker; comment about visit to Israel and Jordon with Godfrey Nicholson; comment about transport arrangements in these countries; comment about post independence India and Pakistan, anecdote about dispute over Indus waters and Edward Wakefield calming situation with speech; comment about travelling in Israel and Jordon; anecdote about ‘Daily Express’ journalist listening in on conversation between JR and Godfrey Nicholson in Iran; comment about JR’s role and purpose of visits. [35:42] Comment about enjoyment JR gained from working in Parliament; comment about intelligence of those working in Parliament; comment about dislike of elections and public speaking outside the House. [37:32] Discussion about JR’s role as Secretary of State for War; anecdote about receiving telephone call from Harold Macmillan; comment about feelings upon receiving the post and anxieties about capabilities; brief comment about work during Profumo Affair. Track 11 [19:34] Comment about JR’s work in War Office after the Profumo Affair; comment about importance of military background of both himself and his father and how this was useful in post of Secretary of State for War; comment about role of War Office recruiting soldiers; description of travelling to Iraq during Iraq-Kuwait crisis; comment that it was a genuine crisis. [05:55] Comment about the War Office civil service, especially Arthur Drew and Richard Way [known as Sam Way]; description of War Office civil servants. [07:02] Comment about how being Secretary of State for War affected work in the constituency; comment that working in War Office reduced contact with House of Parliament and other MPs; comment about reorganisation of War Office in 1964. [10:04] Comment about role speaking for the War Office in Parliament; mention of closing Woolwich Arsenal; description of civil service advise. [11:00] Comment about relationship and rivalry with other MPs after being promoted to Secretary of State for War. [12:07] Brief comment about Profumo Affair being uncomfortable. [12:51] Comment about why JR came to leave Parliament; his displeasure at not being offered a job by Edward Heath; comment about family concerns and not wanting to remain a backbencher; comment regarding regret, especially given Margaret Thatcher’s later rise to power and JR’s friendship with her in Parliament. [16:02] Comment about adjusting to life after Parliament and work after Parliament with Prudential and London Clinic where he met Paul Getty. [17:16] Comment about how Parliament provided a good education for JR; description of what JR misses about Parliament; comment about lack of contact with Parliament after retiring; concluding comment about not missing elections.